So, having read my earlier posts (you did read them, right? If not, click to read Part 1 and Part 2), you know the care that we put into finding the right blend of espresso beans and roasting them to produce the most flavorful espresso. We wanted to be certain that our espresso was of the highest quality before we offered our new espresso beverages to our guests. Having landed on what we felt was the best combination of beans, blend, and roast level, we were finally ready to test our espresso program in one of our restaurants. The newly-opened Waterfront Eat’n Park in Homestead, PA, was our testing ground and the first Eat’n Park restaurant to offer espresso beverages. Guests loved it, and our servers were just as excited. In fact, one server’s experimentation with combining espresso with our classic hand-dipped milkshakes resulted in the creation of the incredible Vanilla Latte milkshake, which then led to further expansion of our espresso offerings. When we were ready to roll out the new beverages to our other locations, we didn’t take the task lightly. All of our servers and managers went through thorough three-day training on how to create our made-to-order espresso drinks. Our team of trainers, nicknamed the “Bean Team”, traveled to every Eat’n Park location to ensure that each and every Eat’n Park server and manager knew how to craft a delicious espresso beverage, be it a latte, cappuccino, or espresso shot. As you may have guessed, we take a lot of pride in the quality of our espresso drinks. We offer guests their choice of 1%, skim, or soy milk, with every drink made to order from freshly roasted beans. Our espresso rivals any you’d find in a specialty coffeehouse, at a better value! For the uninitiated, the best way (at least in my opinion) to try an espresso without having a straight shot (which for some people is overwhelming) is to try an “Americano”. An Americano is a shot of espresso combined with a cup of hot water. When the weather is warm, I really love an iced Americano. Cool and refreshing, and WAY better than any iced coffee you can get anywhere. But don’t let my personal taste be too much of an influence. We have a great selection of espresso drinks to suit almost any taste – just click here to see our online espresso menu. Whether you like yours hot, iced, or mixed into a milkshake, you’ll find something you’ll love at Eat’n Park. It’s just another reason that we’re the Place for Smiles! P.S. Try our new Egg Nog Chai Tea, on the house. I know you're going to love it! Click here to print your coupon, good through 12/24/2009. Happy Holidays! If you read my first post in our series on our espresso beverages (click here to read it now), you know that when we began developing our espresso program, we painstakingly tested hundreds of different espresso beans to find the perfect blend. We eventually landed on three varieties of beans from Costa Rica, Guatemala, and Brazil. But choosing different coffees that complement each other perfectly is just the FIRST step. Next, and just as important, is roasting. When developing our espresso beverages, we spent just as much time searching for the perfect blend and roast level as we spent selecting the beans. The three coffees are first blended to our proprietary recipe, then roasted together in small batches locally here in Pittsburgh. By blending before roasting, we are able to get a nice harmonious flavor which allows the different coffees to complement each other. And small batch roasting allows us to keep an eagle’s eye on each roast to make sure it is perfect. It also allows the freshest possible coffee. And espresso is just not darker roasted coffee…or at least our blend is not. Just because coffee is dark roasted doesn’t mean it tastes good. If the bean is not right, and matched with the perfect roast profile, it is just bad coffee roasted to taste burned!! Oh, and one last thing…without good, clean water nothing will taste good. After all, at least 80% of every espresso shot is water. It is a critical ingredient, and the one that most places overlook. But, not us…we filter ALL of our water at Eat’n Park. The water in our coffees, iced teas, and Pepsi are all filtered in house in a special system designed by our quality control team to ensure high quality beverages EVERY time. With the beans and roast level finally selected and our filters ready to dispense fresh, clean water, we were ready for our guests to try our new espresso drinks. In my final installment, find out how our made-to-order beverages are individually crafted for each and every guest. P.S. I want you to try one of our lattes, on the house. I know you're going to love it! Click here to print a coupon for a free small latte, good through 11/20/2009. Smiley’s gone commercial! You can now find our icon’s famous face on our official Smiley Stuff merchandise, featured on everything from t-shirts to mugs to chocolate (and, of couse, our legendary Smiley Cookies)! All of our restaurants now carry a limited selection of items, like Smiley Chocolates (produced locally here in Pittsburgh by Sarris Candies) and our Smiley mugs, available in ceramic and travel versions. If you’re looking for our Smiley apparel, available for infants, children, and adults, you can find it at one of our Pennsylvania Eat’n Park locations below, in addition to our online store. Click here to find the hours and driving directions for the Eat’n Park location nearest you. New Gluten-Free Bun Available at Every Eat’n Park! We have an exciting announcement for our guests who have celiac disease: we now have a gluten-free bun available in all of our restaurants! This new rice/tapioca-based bun is similar to an Italian-style roll, and we think you’re going to love it. Unlike some other gluten-free breads, it doesn’t have a dry, crumbly texture. In fact, it’s delicious! We’ve always done our best of cater to our guests’ various dietary needs, and the back of our menu is a great resource for anyone on a low-calorie, reduced-sodium, vegetarian, or celiac-friendly diet. However, for those with gluten allergies, this new bun opens up a whole new world of celiac-friendly possibilities at Eat’n Park. Click here to see all of our other gluten-free items. Just ask your server to substitute the new bun with your next meal, and as always, be sure let him or her know if you have a gluten allergy, so that we can avoid cross-contact with gluten ingredients when preparing your meal. Because we love coffee!!!! When I say we love coffee, I mean we like to drink it, we like to smell it, and we like to talk about it. And since we care, we spend A LOT of time making sure we start with the best ingredients, follow through with the perfect roast, and offer our guests nothing less than an expertly crafted espresso drink. My name is Brooks, and I’m the Senior Vice President of Food and Beverage here at Eat’n Park. Among many other things, I oversee our espresso program, from sourcing the best beans to developing the perfect roast. Because I’m so passionate about the quality of our espresso beverages, I’m going to be writing a series of posts about our espresso and what makes it so good. Before I get ahead of myself, you’re probably wondering how a family restaurant chain like us began offering espresso in the first place. Back in the late 1990’s, we noticed that interest in espresso-based coffee was growing, and that there was a developing trend toward high-quality, flavorful blends. Because we’re known for our classic breakfasts, we thought that espresso beverages would complement our menu and be well-received by our guests. Much like our strategy with the rest of our menu, our goal with espresso was to offer a high-quality product at an approachable price. All coffee in the world is grown between the Tropic of Cancer and the Tropic of Capricorn. And while there are limited places in the world it can be grown, it doesn’t mean that all areas are created equal. Coffee is a lot like wine, and choosing the right region is the first step towards having great coffee. To grow great coffee, you must have a balanced, harmonious environment and a farmer that is committed to high quality. These are the underlying principals driving Eat’n Park’s coffee program, and is the base of our espresso beans. In our search for the highest-quality beans, we tested hundreds of varieties from many different regions. We finally landed on a flavorful blend, one that allows individual flavors to come through without being overpowering. The coffee beans in our espresso blend come from three small and distinct regions: the central valley of Costa Rica, an eastern region of Guatemala called “El Oriente”, and the Bahia region of Brazil. The “La Lapa SHB” coffee from Costa Rica is chosen because of its full body and ability to take on a dark roast and still hold its bright flavor. The “Arte Maya de Cafe” coffee from Guatemala provides a nice heavy body while retaining good acidity. And the Brazilian “La Minita Prep” is a highly consistent coffee with a full body and a very clean finish. All of our coffees are shade grown at very high altitudes, which is the best growing environment for high quality coffee. We work directly with the grower and producer of the beans to ensure the finest quality…no middle man here! In fact, every two years, we take a group of Eat’n Park team members directly to the coffee farms, where we can see firsthand the care that goes into creating our beans. This gives us a better understanding of coffee, and how minor climate changes affect the flavor of the beans. We’re also continually testing different beans to ensure that we are offering the best blend for our guests. But choosing the right blend of beans is only the first step in creating a delicious cup of espresso. Roast level is just as important, but I’ll get into that in my next post. P.S. Here's a little treat for you loyal blog readers....try our Pumpkin Chai Tea for free with the coupon below. Just click here for a printable version. Labels: Sustainability, What's on the menu? Like most employers, we look for certain qualities in a team member, although you may find ours a little unique. At the top of our list is an individual who knows how to smile. After that, we look for someone who's bright, hard-working, knows how to be a team player, and wants to make Eat'n Park an even warmer, friendlier place. If you're looking for a career in management or at our corporate office, visit our Careers section at http://www.eatnpark.com/careers.asp to see what positions are available. If you're interested in a hands-on job at your local Eat'n Park restaurant, we always have openings for friendly servers, greeters, cooks, buspersons, prep workers, and dishwashers. Just stop in and speak to the manager on duty - he or she will be able to tell you what jobs they're currently hiring for, and can have you fill out an application to be considered for an interview. Click here to find the Eat'n Park nearest you. Finally, if you are seeking an internship to round out your college experience, click here to read more about our internship program. We receive a lot of requests for the ingredients in our famous Smiley Cookies, especially from guests with food allergies. While we can't share the recipe for our delicious cookies, we can tell you that they contain the following allergens: wheat, soy, egg, and milk. For those who are allergic to tree nuts, it’s also important to note that while the Smiley Cookie itself does not contain any nut products, these allergens are present in our restaurants, where the cookies are iced and baked. 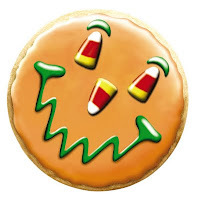 Additionally, the candy corn on our Halloween Smiley Cookie is produced in a factory that also processes nuts. But no need to fear... SmileyCookie.com is here! At SmileyCookie.com, you can order individually wrapped cookies that are both nut free AND kosher. (That also includes the candy corn on our Halloween cookies!) Plus, we'll ship them right to your doorstep to make life easy on you. Click here to check out our nut free cookies today! If you have any additional questions about ingredients or allergens in any of our menu items, please email us at responses@eatnpark.com. We’re happy to announce that earlier this summer, Chef Regis Holden, our head of menu development and frequent blog contributor, learned that he had been awarded a very special honor: He was named 2008 Chef of the Year by the Laurel Highlands Chapter of the American Culinary Federation (ACF). Congratulations, Regis! Regis was honored not only because of his accomplishments at Eat’n Park, but also because of his service to the ACF and his work with students at Westmoreland County Community College, where he is a part-time instructor. He is also a Certified Executive Chef and Certified Culinary Administrator. A 25-year Eat’n Park veteran, Regis has had a hand in developing almost everything on our current menu, including our award-winning American Grill Burger, which he developed from a family recipe (click here to read the full story). Along with Chef John Frick, Regis works to continuously add fresh new items in with the classic favorites that our guests know and love. With Regis’ prestigious award came a gigantic trophy engraved with the names of all the past winners. Though he has taken a fair amount of good-natured ribbing over the size of the trophy (now on display at his desk here at our office), we’re certainly proud of Regis for his contributions to Eat’n Park and to the culinary community.